Roadstar Caravans has launched a new van for its GT range, an entry-level rig to suit budget-conscious buyers. Of the many caravan manufacturers and dealers I’ve met over the years, few have shown more passion to quality and product improvement than Roadstar Caravans’ Ken Nizam. Five minutes with him and it’s clear that he believes in his vans. However, being known as a top-end manufacturer comes with a built-in assumption that its vans must be expensive and, for some people, out of their price range. 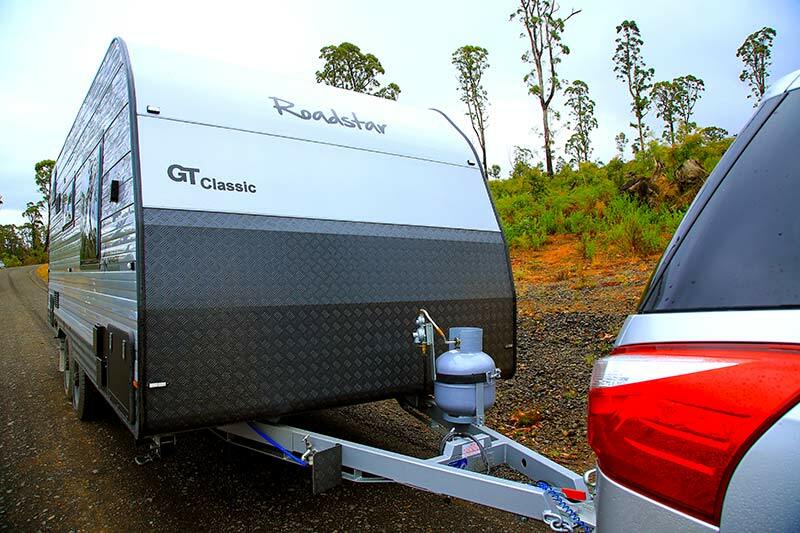 To combat that perception, Roadstar Caravans has launched a new rig in its GT range: the Classic. At $59,990 (RRP), the 19ft (internal length) model reviewed here represents excellent value for money. Sitting in the $50,000 to $60,000 ‘sweet spot’, it should attract budget-conscious buyers. The GT range also includes the Cross Country and the range-topping Sport. Being the new, entry-level GT model, the Classic misses out on a few features found in its GT cousins, such as a reversing camera, but it remains well-appointed. The Roadstar Caravans Classic is available in a single-axle 17ft 6in model, a tandem-axle 18ft 6in model, and this 19ft tandem-axle model. 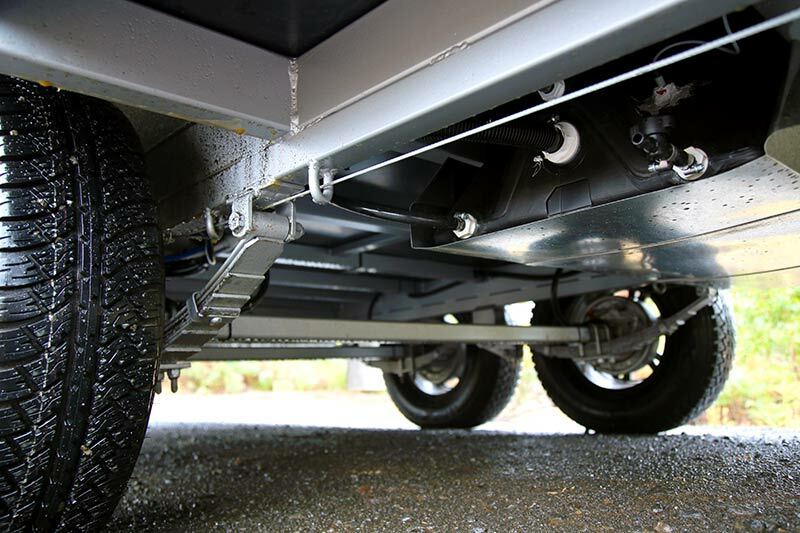 The tandem-axle models are only available with roller-rocker leaf-spring suspension; however, the single-axle model gets Dexter independent rubber suspension. Interestingly, the 19ft Classic is about 100kg lighter than the closest equivalent GT Sport, despite being slightly longer. The cabinetry and furniture throughout the GT Classic is computer-designed and cut. It’s all made from ply – Roadstar does not use any MDF or chipboard. It contains Roadstar’s characteristic handle-less overhead-locker doors, and the fit and finish is millimetre-perfect. The rear bathroom is equipped with a top-loader washing machine beneath the vanity benchtop, a cassette toilet, a washbasin, and a nearside, fully-moulded fibreglass shower. 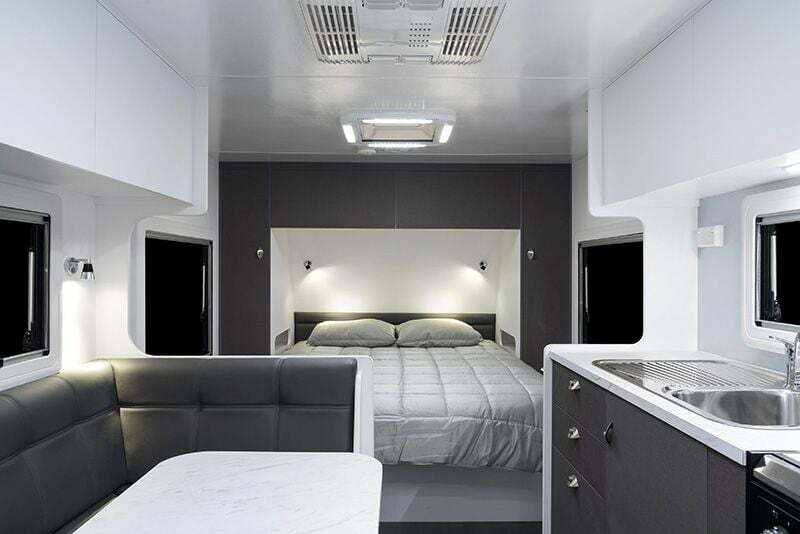 The offside kitchen, meanwhile, has a four-burner cooktop and griller, a decent amount of cupboards and drawers, three overhead lockers, a 150L three-way fridge with microwave above and more. Any reasonable person would conclude that bench space in this van is on the small side; however, that’s the trade-off in a van such as this. A larger kitchen would equal a large van and the additional weight that goes with it, or perhaps a smaller bedroom or bathroom. 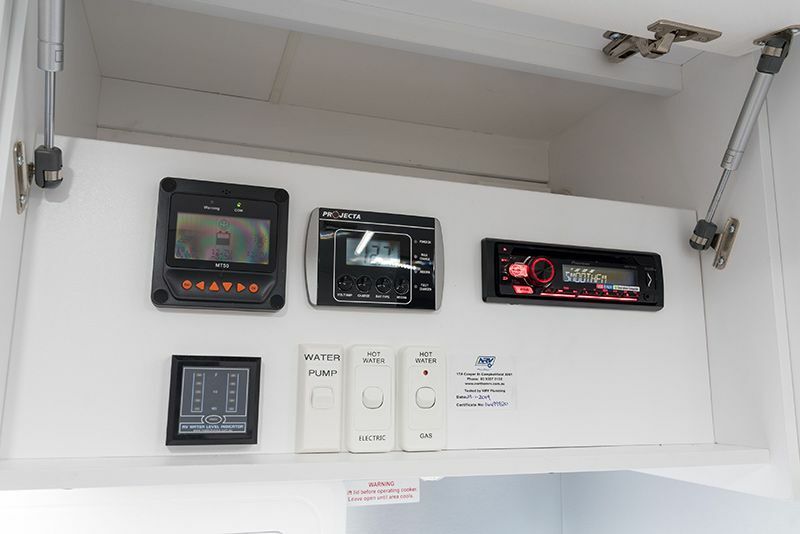 All switches and controls, from the water level indicator and digital voltmeter, to the solar regulator and onboard sound system, are centralised in a locker above the kitchen bench, which certainly decreases ‘clutter’ on the van’s walls – a good move. 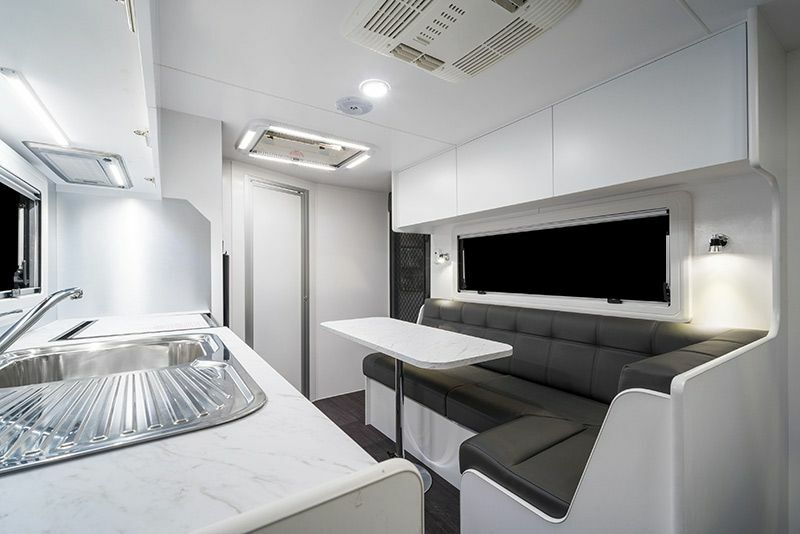 The L-shaped dinette is equipped with reading lights, overhead lockers, and even a 12V point in the leg space, allowing you to keep your devices charged while you use them in the lounge. The front bedroom has the expected surrounding wardrobes and overhead lockers. I liked the bedside niches allowing easy access to your reading glasses, book, etc. ; however, I’d love to see a 12V point in each in addition to the supplied 240V powerpoints. While the aluminium-clad GT Sport (it’s also available in composite fibreglass) has a front window with stoneguard, the GT Classic does not. But I didn’t really notice the absence. The windows throughout the van are the largest available – each also incorporates a mesh screen and block-out blind. At the end of the kitchen bench, facing the bed, is a swivel arm for the standard 19in flatscreen HD TV with inbuilt DVD player. Naturally, a 12V point and antenna jack is nearby. Beneath the 6ft 4in x 5ft mattress, you’ll find a decent storage space, despite the fact it’s partially occupied by the offside hot water service, which is neatly partitioned off with CNC-cut ply. Of course, features such as a reverse-cycle air-conditioner, LED lighting and rangehood, are all included. I had a good look over this van in search of something to criticise, but in truth I found very little. The hole beneath the kitchen sink through which the drainage hose runs was slightly splintery – but beyond that I couldn’t fault the van. The quality is indeed high. Like others in the Roadstar line-up, the GT Classic is available with a timber or aluminium frame, smooth or ribbed aluminium cladding, or full fibreglass composite panelling. There aren’t many Australian caravan manufacturers that can offer all main build techniques for each of their models. Our meranti-framed, aluminium-clad GT Classic rides on a chassis that’s built in-house. Roadstar’s sister company, Australian Hitec Engineering – also owned by Ken Nizam – builds every Roadstar chassis. According to Ken, this allows the company to control all aspects of production. Our GT Classic rode on a 4in SupaGal unit with a 4in drawbar and a 2in riser at the suspension that runs to the back of the van. The beam-axle leafspring suspension seemed quite adequate for a van of this type and, during our road test, it performed as expected. Indeed, the van towed very well at all speeds. Up front, one 9kg gas cylinder is fitted to the drawbar, along with a ball coupling and Anderson plug, while just behind is a full-width tunnel boot fitted with marine hatches. A Sunburst roll-out awning is fitted, too, along with a couple of external speakers, an LED awning light and entrance grab handle, and a 12V point. While our review van sported an external skin of low-profile ribbed aluminium, the front and rear had smooth composite aluminium. I loved the colour-matching J-mould insert, too. Roadstar uses a special polymer adhesive sealant to seal and finish the van. 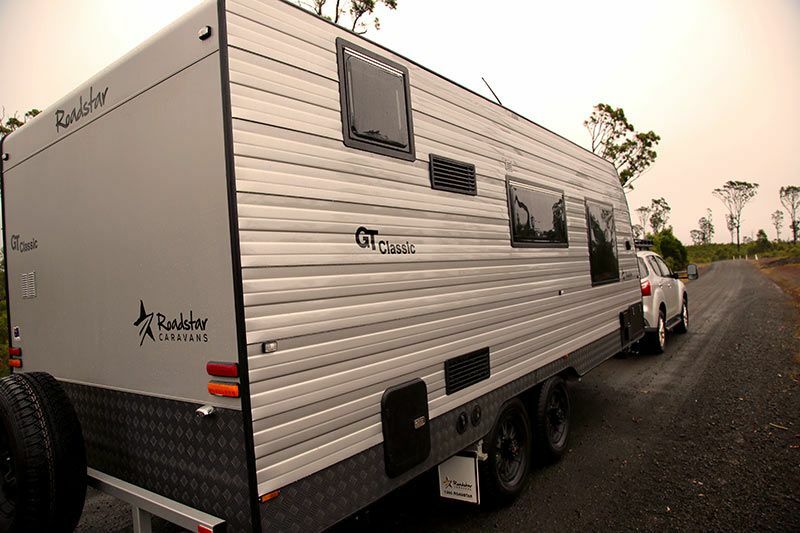 Weight-wise, the Roadstar Caravans GT Classic is built to appeal to owners of mid-level 4WDs, such as the Prado. At Tare, our 19ft rig weighed a reasonable 2010kg and had an ATM of 2460kg, providing a payload capacity of 450kg. So even with the dual 95L water tanks full, and travelling with a full cylinder of gas, there’s over 250kg left to account for food, luggage and gear. I reckon that’s pretty reasonable. In terms of 12V power, the GT Classic receives as standard a 150W roof-mounted solar panel to charge the onboard 100Ah AGM battery – perfectly adequate for a few days of free-camping. The Roadstar Caravans GT Classic is certainly an appealing proposition. Technically, it is an ‘entry level’ van but that is in no way reflected in the cut-above attention to detail. 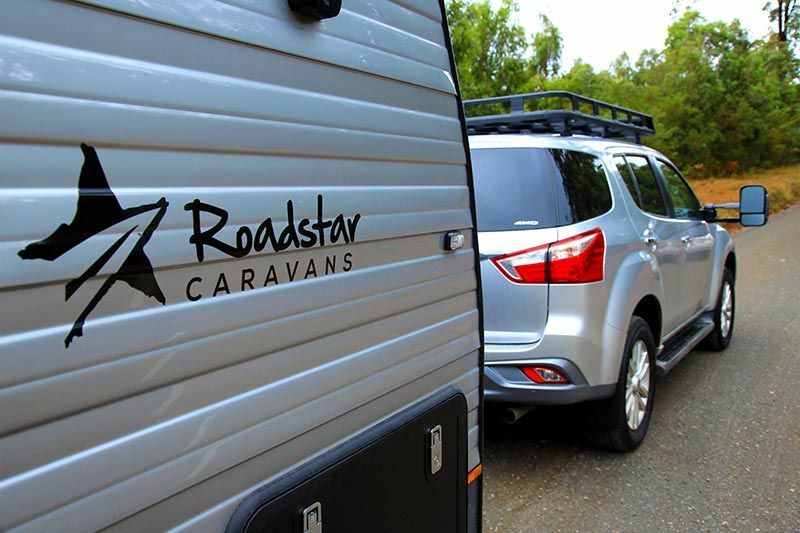 Roadstar has taken the care shown in its upper-level vans, such as the Daintree, and applied it to a competitively-priced package. Indeed, in the $50,000 to $60,000 price bracket, the GT Classic is a particular standout.